Radio Controlled Airplanes for Beginners! Radio controlled airplanes for beginners usually start with highwing trainer aircraft. Today's beginner rc pilot can choose a ARF(Almost-Ready-To-Fly) model, and fly in 24 hours. Purchasing your first rc model airplane, should be a great deal of fun. That is why a highwing trainer is highly recommended for the new pilot. 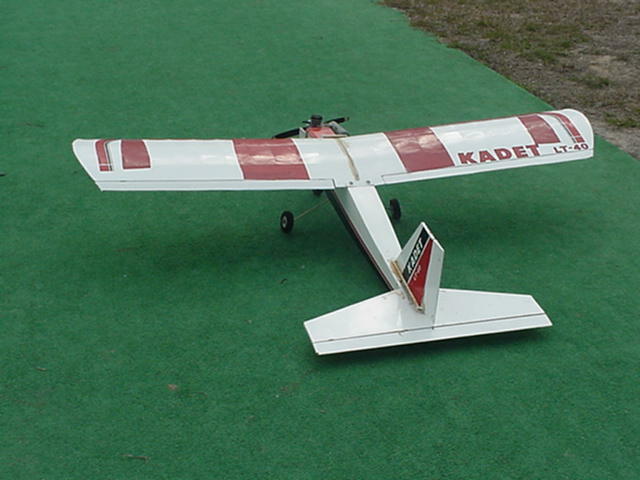 The model shown above is a Sig Kadet LT40 it has a wing- span of 70". These rc model planes fly very gently through the sky, allowing you to learn flight basics. These RC model airplanes come in 40 and 60 sizes. What is the different between the two aircraft? A 40 size plane, has a slightly smaller wing. They fly very well in the air, and are a good first choice. Tip - If possible purchase as a (ultimate combo - engine and 4 channel radio) included to complete your airplane. A 60 size plane has a larger wing, thereby providing better visibility in the sky. Large wings also provide greater stability. Tip - If possible purchase also as (ultimate combo - engine and 4 channel radio) included to complete your airplane. - Follow the instructions of the aircraft manual. - Read the manual until you get a good understanding of it. - Do NOT skip steps, follow the manual as instructed. - IF you need HELP, visit a rc hobby shop and talk to an experienced airplane salesperson about your aircraft. Many experienced rc salesman can answer many of your questions, so ask about everything you do not understand! New to Hobby of Flying Airplanes, visit RC-Beginner-Tips!